Have you ever thought that you wish there were effective prayers you could use to ask for guidance and good outcomes throughout the day? The power of prayer in our lives can be quite amazing. I wasn't a pray-er for many years, but have come to see that it does work miracles in my life, sometimes small, sometimes life changing. I have found something called Most Benevolent Outcome prayers (or MBOs) that have quickly become a major part of my daily routine. This way of praying for benevolent outcomes comes from Tom T. Moore. Tom's guardian angel, Theo, outlined this method of praying for positive outcomes and Tom relayed it, along with many examples of how it works, it his book The Gentle Way: A Self-Help Guide for those who Believe in Angels . 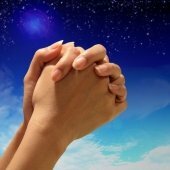 The form that a benevolent prayer takes depends on whether you are praying for an outcome for yourself or for someone else. I request a most benevolent outcome for ..... Thank you. You can direct the prayer to your guardian angels by asking them directly: Guardian angels, I request a most benevolent outcome for... or just say the prayer and let the universe handle who will help you. Let's say it is a busy day at the mall and parking spaces are at a premium, especially spaces that are anywhere near the actual stores. You can say "I request a most benevolent outcome for finding a parking space close to the mall entrance. Thank you". Say it with conviction and with the belief that you really will find a good parking space. Drive around a bit and low and behold, most of the time I have used this prayer, a prime parking space suddenly appears right near the entrance. 1. Do not forget to say "thank you" at the end of the prayer. It is important that we recognize the help we are given from the other side and that we express our gratitude for this help. 2. At the end of the prayer you can also add the statement "And may it be even better than I hope for or expect". Add this statement after you have made your benevolent outcome request and say it with enthusiasm, as though you just thought of it and are excited to ask it. I request a most benevolent outcome for ..... Thank you. And may it be even better than I hope for or expect. Thank you. I always add the second thank you as I would be even more grateful if my request exceeded what I ask for. Or you can save your thanks for the end of the prayer. I ask any and all beings to come to the aid and assistance of (name) to help..... And may it be even better than I hope for or expect. Thank you. I ask any and all beings to come to the aid and assistance of my child (name) to protect her as she walks to school today. And may it be even better than I hope for or expect. Thank you. This method of praying results in simple prayers, but very effective outcomes. It asks two things from you - your belief and your sincerity in asking. For things that are important to you and maybe more long term in coming to you, such as health, relationships, job, money - I would repeat the prayer once a day. Please go here to continue reading examples of benevolent prayers. Find prayers for prosperity here. "No man ever prayed heartily without learning something."